Many seniors are searching for ways to improve their quality of life and remain active as they enter midlife and later years. Nationwide, people are recognizing yoga for its ability to slow down and reverse the aging process. A complete health system, yoga not only restores vitality to the body, but also expands the mind and soul. Yoga transforms the years after 50 from a time of deterioration to one of increased perspective and illumination. In The New Yoga for People Over 50, readers will learn how the health of the spine and posture affect every sustem of the body, and how yoga positions and breathing exercises benefit the circulatory system, the heart and other vital organs, relieve menopausal symptoms, and remove stiffness and inertia from the body. In this comprehensive guide, Iyengar yoga expert Suza Francina describes and illustrates how to begin and maintain a yoga program through personal stories and over 100 easy-to-follow instructional photos of older teachers and students. We need to change our idea of what aging is. If I know my biological potential is 130 years, then I donÆt consider myself middle-aged until IÆm 65. . . . One of the great principles of mind/body medicine is that expectancies determine outcome. If you expect to remain strong in old age, you will. As a society and as individuals, we can expect that our notions of aging will continue to change dramatically in the years ahead. Leading pioneers in the field of mind/body medicine such as Deepak Chopra, M.D., an endocrinologist, bestselling author and internationally recognized authority on how our consciousness affects our health, urge us to consider the power that our beliefs about aging have over us. The latest research shows that how we age has more to do with our belief system and mindset about aging than any other factor. In the last several decades, gerontologists have proved that remaining active throughout life halts the loss of muscle and skeletal tissue. The news is spreading among older people that they should continue all the activities they enjoyed in earlier yearswalking, hiking, bicycling, gardening, golf, tennis, karate, swimming, dancing, yogayou name it. Not long ago, a wild, 100-year-old daredevil named S.L. Potter, defying age, common sense and the fears of his physician and children, made his first bungee jump from a 210-foot tower. Further evidence that we are redefining what is appropriate in old age were photographs in the news of two of AmericaÆs oldest sisters, Sarah and Elizabeth Delany, then ages 102 and 104one practicing Shoulderstand, the other stretching in a yoga pose with one foot behind her head. What happens when we change our old expectations about aging? Gerontologists from Tufts University found out when they put a group of the frailest nursing home residents, ages 87 to 96, on a weight-training regimen. Traditionally doctors believed that this type of elderly person belonged in bed, in a rocker or wheelchair out on the porch or in front of the television. Exercise would exhaust or kill these fragile people. Instead, they thrived. Within eight weeks muscle tone improved by 300 percent. Coordination and balance improved as well. Most important, these elderly peopleÆs confidence in being active returned. Some of them who had not been able to walk unassisted could now get up and go to the bathroom by themselvesan act of reclaimed dignity and independence that cannot be underestimated. The accepted view of the aging process has been one of stiffening, rigidity and closing down. Without proper exercise, the body contracts and we lose height, strength and flexibility. As a result, our natural free range of motion is restricted so daily activities become difficult and in some cases impossible. Yoga exercises reverse the aging process by moving each joint in the body through its full range of motionstretching, strengthening and balancing each part. Most popular forms of weight bearing exercise contract muscles and tighten the musculoskeletal system, adding to the stiffness that normally settles into the body with the passage of time. In our youth-oriented culture, obsessed with thinness, we tighten the muscles to make the body look firmer. What is much more important, however, especially as we grow older, is opening and expanding the body so that the aging process is tempered. Insurance companies, gerontologists, cardiologists, senior exercise physiologists and other health care professionals interested in preventing chronic illness and disability in the older population are becoming increasingly interested in what yoga has to offer older people. According to Age Wave authors Ken Dychtwald and Joe Flowers, 100 million Americans are changing what we think about aging. Today, there are more older people alive than ever before, and increasing numbers of them are over 85. As the population grows older, we are discovering that chronological age is only one way to measure aging, and perhaps the least accurate one. Chronological age matches what physiologists refer to as our ôbiological ageö only when we are very young. As the years pass by, biological time slows down; the older you are the more slowly you age. By the time we enter midlife, biological age becomes less significant than qualities like zest, energy, enthusiasm, confidence and contentment. In over 20 years of teaching yoga to people of all ages, shapes, sizes and temperaments, IÆve seen wide variations in the ways human beings change. In the 1970s, the American Medical AssociationÆs Committee on Aging concluded a 10-year study by declaring that it had not found a single physical or mental condition that could be directly attributed to the passage of time. Stress- and diet-related conditions such as high blood pressure, heart disease, arthritis, osteoporosis, loss of muscle strength, reduction in motor fitness (i.e., balance, flexibility, agility, power and reaction time), reduction in respiratory reserves (breathing capacity), constipation and diseases associated with elimination, diabetes, sleep disorders and depression are experienced by young and old alike. We now know that many of the classic symptoms of aging are caused by inactivity or the wrong type of activity (i.e., mechanical, imbalanced forms of exercise that strain the body), inadequate nutrition and accumulated stress and tension. Even such common outer symptoms of agingpoor posture, rounded shoulders, dowagerÆs hump, closed chest, stiffness and loss of mobilityoriginate when we are younger and become increasingly pronounced as the years go by. Medical services have become very efficient at diagnosing what is wrong with older people. Physician services and the advent of antibiotics have given doctors excellent control of infectious diseases. Hospital and surgical services for illness and injuries have become so proficient that many who would have died at 50, 60 or 70 now live longer. Many people assume that because the elderly are living longer, they are in good health. Certainly a small percentage of them are, but many aging people suffer from serious and disabling health problems. A closer look at older people who have been saved by modern medicine finds that a high percentage of them are suffering from degenerative diseases. Arthritis, osteoporosis, heart disease, chronic fatigue, cataracts, macular (visual)degeneration, diabetes and cancer are common. While traditional medicine offers drugs, surgery and other methods to treat degenerative diseases, it does not offer the means to prevent them. Eight prescriptions are written each year for every person in the United States, and even more for the elderly. Older people have been known to take as many as 30 different medications during the last year of their life. Each year in the U.S., medication problems are the cause of more than 250,000 hospitalizations for people 65 and older. People are no longer content to be shuffled from doctor to doctor, only to be told that their illness, pain or degeneration is normal for their age, and to go home, take their medication and get plenty of rest. Our present primary health-care delivery system, which until recently has ignored prevention and health, is failing us at a cost of billions. This is the reason ôalternativeö health systems are now becoming mainstream. Chiropractic, homeopathy, herbs, acupuncture, massage, nutrition, Ayurvedic medicine, yoga and others are coming into their own as people share positive experiences with these health systems. These more holistic therapies are safe and generally offer a less expensive means of helping people suffering from many acute and chronic conditions. They are restorative in nature, help to recharge and revitalize the bodyÆs precious stores of energy, and thus help to prevent illness, disease and degeneration. Yoga offers a uniquely holistic approach to health. This ancient science, with its deep roots in Ayurvedic medicine, is truly the most complete system of self-health care that exists. The best part of it is that it is something you do to yourself, for yourself. It is an active, rather than a passive, approach to keeping yourself healthy and fit. As I grow older, it is liberating and exhilarating to feel more freedom of movement, openness and extension in my joints and muscles than back in my younger years. As a teacher, I find it a continual revelation to see how the bodies of people of all ages respond to yoga and proper exercise. My general health, well-being and joy in life have increased immeasurably. It seems to me that the most important thing that seniors can do to enhance their lives is to change their lifestyle to include yoga with experienced and qualified instructors. To have it work for each of us, we must DO IT frequently. I have had many inspiring experiences working with students over the age of 50. They involve all aspects of healing, including reduction of rheumatoid arthritis; recovery from frequent headaches, numbness in hands; backaches; and remission of multiple sclerosis. Those who have the discipline to stay for six months or more report their increased feeling of well-being and enthusiasm for life. Their range of movement increases dramatically, enabling many to return to physical activities they thought were lost forever: gardening, climbing uphill, biking, reaching and bending, and simply sitting comfortably on the floor. The wonderful progress people in this age range make has inspired me to start taking ôbeforeö pictures of the ones I believe will make a commitment to yoga. After six months or so, we can document their progress with ôafterö pictures. The changes might be dramatic or subtle. People often forget how they felt or looked pre-yoga. My shoe size slowly moved from a 61/2 N to now an 81/2 N or B, and the flat footprints of my childhood are now footprints with arches. My seated poses, such as sitting with the soles of my feet together (Baddha Konasana), were once with rounded back and knees very elevated. My knees now touch the floor without wall support (on a stretched-out day). I am comfortable doing the Lotus in Headstand (Pindasana). At age 52, for the first time in my life, I did the Splits (Hanumasana), and at age 55 I did a mid-room, Full Arm Balance (Adho Mukha Vrksasana), dropping back to the Upward Bow (Urdhva Dhanurasana). ¬1997. All rights reserved. 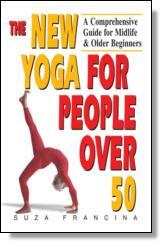 Reprinted from The New Yoga for People Over 50 by Suza Francina. No part of this publication may be reproduced, stored in a retrieval system or transmitted in any form or by any means, without the written permission of the publisher. Publisher: Health Communications, Inc., 3201 SW 15th Street, Deerfield Beach, FL 33442. Suza Francina is the author of The New Yoga for Healthy Aging: Living Longer, Living Stronger and Loving Every Day, Yoga and the Wisdom of Menopause: A Guide to Physical, Emotional and Spiritual Health at Midlife and Beyond and The New Yoga for People Over 50: A Comprehensive Guide for Midlife and Older Beginners. She is a graduate of the Iyengar Yoga Institute of San Francisco, a certified Iyengar yoga instructor, a member of the International Association of Yoga Therapists and a Registered Yoga Teacher with Yoga Alliance. She has over thirty-five years of experience in the fields of yoga and exercise therapy and is a consultant for research studies about yoga. Suza's interest in yoga and health began many years ago when she worked as a home health care provider for elderly and convalescing people. This gave her the opportunity to observe firsthand the mental and physical changes that often occur in the later years of life. Suza's writing has appeared in numerous magazines, including Yoga Journal, LA Yoga, Prevention, Pause, Yoga Life, Yoga for EveryBody, Yoga Vidya, Let's Live, Senior Life, and numerous books, including Women's Health Care: A Guide to Alternatives The Holistic Health Handbook, American Yoga The Arthritis Cure Fitness Solution, Living Your Yoga The Rodale Book of Building Stronger Bones for Life, and Prevention's Complete Book of Walking. Her books have been published in several languages, including German, Russian and Portuguese. She is a monthly columnist for Eldr magazine, and The Washington Post, the Los Angeles Times, and dozens of other newspapers around the country have featured Suza and her work. She has also done numerous radio interviews and television appearances. Fit TV/Healthy Living (Body by Jake Productions, National Cable Network), and the AARP Maturity Broadcast News have videotaped and televised her classes for people over 50. Her work with older students has been featured in AARP magazine. Suza was born in 1949, in The Hague, Holland, and is of Dutch–Indonesian heritage. She lives in Ojai, California, a valley widely considered one of the most beautiful and sacred places on Earth. She is a former mayor of Ojai and a spokesperson for sustainable lifestyles. Suza specializes in classes and workshops for people beginning yoga at midlife and older. In her lectures and workshops, she shares inspiring stories about her students and teachers while discussing the benefits of yoga for healthy aging. She offers group and private classes in Ojai, and teaches yoga nationally to people of all ages in a wide variety of settings. Suza is the mother of a grown son and daughter and enjoys living close to nature with a family that includes several dogs, cats and other sentient beings.